Over the years, the Llanfyllin Music Festival has evolved and expanded to encourage members of all ages from the local and wider community to attend concerts by not only the Allegri but also a variety of performers as an introduction to what the Festival has to offer in the new millenium. Those unfamiliar with live performances of music, song and the spoken word, as well as world class renditions of chamber music, are warmly welcome. We hope this first taste will tempt you to become a part of our Festival for years to come; and for those already well established supporters of the Allegri Quartet and the Gŵyl Gerdd Llanfyllin Music Festival, we thank you for your continuing and encouraging presence. In 2009 the Festival had programmed a Family Concert at the Llanfyllin Workhouse, where children and adults alike enjoyed listening to, and participating with, The Allegri String Quartet and acclaimed harpist Leuan Jones. It was voted a huge success, and superb value for money. On July 8th, The Penybontfawr Male Voice Choir performed an evening of Summer Music at nearby Bodfach Hall, Llanfyllin. In 2010, a Young Musicians' Concert, performed in Welshpool's Methodist Church, featured talented musicians from the length and breadth of the county. In October, a Harp Gala at Theatr Hafren, Newtown, featuring nationally and internationally acclaimed harpists, Uilleann pipers as well as the Llansilin and Penybontfawr choirs , proved a sellout success. 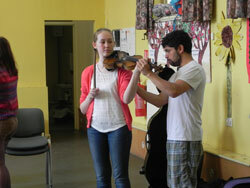 The same year a world premiere of a song cycle by young composer Matthew Taylor was performed. In 2011, on Sunday 10th July, the Festival ran a Children's Concert given by local musicians (Sue on keyboards, Geoff on drums, Pamela on vocals) at the Llanfyllin Institute and, together with a Ukelele player, a fun hour was spent, by those who attended, learning about aspects of music and rhythm. Friday 15th July featured an Evening of Summer Poetry and Song with poetry composed and recited by renowned local poet Grey Gowrie, Patron of the Festival and performances by soprano Ffion Davies , harpist David Watkins and pianist David Fisher. 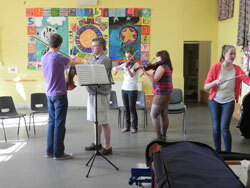 2012 Allegri workshops for young musicians. In addition to their concert performances, the Allegri have kindly offered to take a further series of music masterclasses, specially tailored for young musicians within the county of Montgomeryshire . 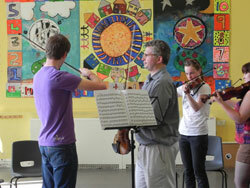 Over the years the Allegri have participated in many such educational workshops with young musicians and the wider community. The Festival Committee is hoping The Allegri Masterclasses will become an annual event and one that will feature as a highlight on the Llanfyllin Music Festival's calendar. and the arts, have rehearsed and performed together with such dedication that their efforts should not go unrewarded. Dates for these workshops will soon be published on the website. More details of all past performances at the Festival can be found on our Archives pages.